Tadashi's college friend, and a member of Big Hero 6. Wasabi's suit gives him access to laser-induced plasma blades. "Would you calm down, Fred? This is serious." Wasabi is a character from San Fransokyo in Kingdom Hearts III. He originated in the Disney film Big Hero 6. He is a member of Big Hero 6, alongside Hiro Hamada, Baymax, Go Go Tomago, Honey Lemon, and Fred. Hiro introduces Big Hero 6 to Sora, Donald and Goofy in Hiro's garage. In the city, Sora's Dual Arrowguns formchange inspires Wasabi to turn his laser hands into projectiles. He is later seen using this while fighting the Heartless. Wasabi is a dark-skinned man with brown hair in dreadlocks and brown eyes. While fighting alongside Big Hero 6, he wears green chest armor and pauldrons with blue pants, a red headband and belt, and a green visor with a black bodysuit with red highlights underneath. Wasabi's gauntlets are equipped with twin cyan plasma blades. Wasabi is rather mature and somewhat serious. Like Go Go, he is also mission-oriented, focusing on planning things out. However, Wasabi is also known for being somewhat cowardly, evident from his fear of heights. Wasabi first appeared in the 2014 Disney animated film Big Hero 6, and subsequently, Big Hero 6: The Series. He is inspired by Wasabi-No-Ginger from Marvel Comics. In the film, Wasabi is an engineering student of San Fransokyo Institution of Technology and a friend of Hiro's brother Tadashi. He helps Hiro in designing the microbots, but when Tadashi dies in a fire, Hiro rallies Wasabi and Tadashi's other friends in stopping the person responsible. 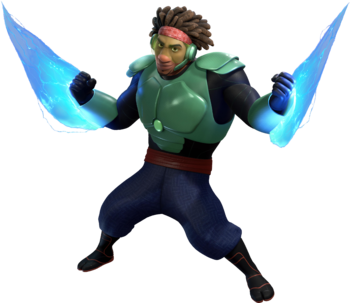 In the film, he is voiced by Damon Wayans Jr.. To date, this is the only appearance of Wasabi in which he was voiced by Wayans; he has since been voiced by Khary Payton in all other appearances. This page was last edited on 17 February 2019, at 01:15.